Big Spring is a city in and the county seat of Howard County, Texas, United States, at the crossroads of U.S. Highway 87 and Interstate 20. With a population of 27,282 as of the 2010 census, it is the largest city between Midland to the west, Abilene to the east, Lubbock to the north, and San Angelo to the south. Big Spring was established as the county seat of Howard County in 1882; it is the largest community in the county. The city got its name from the single, large spring that issued into a small gorge between the base of Scenic Mountain and a neighboring hill in the southwestern part of the city limits. Although the name is sometimes still mistakenly pluralized, it is officially singular. "To the native or established residents who may wince at the plural in Big Spring, it should be explained that until about 1916, when for some unexplained reason the name dropped the final 's', the official name of the town was indeed Big Springs." The area had long been a popular watering hole for Native American residents and nomads, including members of the more recently established Jumano, Apache, and Comanche tribes. The first European to view the site was probably a member of a Spanish expedition, possibly that of Álvar Núñez Cabeza de Vaca, although the record of his travels cannot confirm his visit. 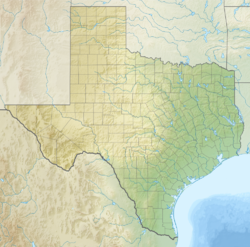 During the 1840s and 1850s Big Spring was often where Comanches assembled and organized themselves before departing on large-scale raids into northern Mexico during the Comanche-Mexico Wars. Captain Randolph B. Marcy's expedition in 1849 was the first United States expedition to explore and map the area. Marcy marked the spring as a campsite on the Overland Trail to California. The site began to collect inhabitants, and by the late 1870s a settlement had sprung up to support buffalo hunters who frequented the area. The original settlement consisted largely of hide huts and saloons. Ranching quickly became a major industry in the area; early ranchers included F.G. Oxsheer, C.C. Slaughter, and B.F. Wolcott. One notable early rancher was Briton Joseph Heneage Finch, the Seventh Earl of Aylesford. Finch purchased 37,000 acres (150 km2) of ranchland in the area in 1883, and is credited with building Big Spring's first permanent structure, a butcher's shop. The completion of the Texas and Pacific Railroad led to the founding in the early 1880s of Abilene, Colorado City, and Big Spring, three railroading and ranching cities where saloons and gambling dens flourished. More important in the city's history was the discovery of oil in the region during the 1920s. The early discoveries in the area marked the beginning of the oil industry in the Permian Basin area of West Texas, and the oil industry has continued to be a dominant part of the area's economy. The oil industry in Big Spring reached its peak during the oil boom of the 1950s. Another major part of Big Spring's economy and life during the 1950s, 1960s, and 1970s was Webb Air Force Base. It initially opened during World War II as the Big Spring Bombardier School. Following the war, it was converted to a US Air Force training base and was named for James Webb, a Big Spring native who died in action during World War II. Webb Air Force Base was active until 1977, when the base facilities were deeded to the city. Big Spring was featured in the 1969 film Midnight Cowboy, which starred Dustin Hoffman and Jon Voight, and received the Academy Award for Best Picture of 1969. The opening scenes featuring Voight, then a relatively unknown actor, playing the character Joe Buck, were filmed in Big Spring and the neighboring city of Stanton. In 1980, Hollywood returned to Big Spring with the filming of Hangar 18. It was a low-budget science-fiction movie about a space shuttle's collision with an alien spacecraft and the ensuing government cover-up. It starred such big names as Gary Collins, James Hampton, Robert Vaughn, and Darrin McGavin, and a host of other B-list actors, including Stuart Pankin, who at that time was relatively unknown. The film received low marks, both in critics' reviews and box-office earnings. Despite its poor performance, it became an instant cult classic, appearing on television under a different title and featuring an alternate ending. Several local residents were used as on-screen extras. Big Spring is the location for the opening scene of the Robert Rodriguez film From Dusk Till Dawn. In 1999, a New York energy company erected the first 80-meter tower for one of North America's largest wind turbines for that time at Big Spring. The FAI World Hang Gliding Championship was hosted by Big Spring in August 2007. The area's "big spring", long dry but recently modified to draw water from Comanche Trail Lake, was of major importance to all life in the surrounding area. 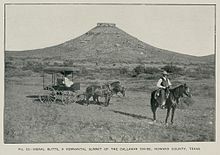 In the early 1840s, it was the center of a territorial dispute between Comanche and Pawnee tribes, and has been a major watering hole for wildlife and prehistoric people in this semiarid area. Early military scouting reports and pioneer accounts describe the water as cold, clear, and dependable; the spring pool was about 15 ft (5 m) deep, with the overflow going only a short distance down the draw before it sank beneath the surface. The spring has mistakenly been described in other writings as being located in Sulphur Draw. It is actually located to the south, near the top of a small, rugged, unnamed draw running eastwards from the spring, and is itself a tributary to Beal's Creek, the name given to Sulphur Draw as it flows into, through, and past the city of Big Spring. Long used by regional inhabitants, both permanent and nomadic, with a large number of locally collected artifacts testifying to its heavy occupation, the spring sat astride the several branches of the later-developed Comanche War Trail as they converged on this important water hole from beyond Texas, coming south across the Northern Plains and the Llano Estacado. From the Big Spring, the war trail continued south via three branches, one to the southeast through the western part of the Concho country; one going almost due south, heading for Castle Gap and Horsehead Crossing on the Pecos River; and one heading west to Willow Springs in the sand country southwest of present Midland, before turning south down the Pecos, all headed ultimately for Mexico. As whites began to settle the western territories, the spring continued to serve as a major watering place on the southern route of the Gold Rush Trail of the early 1850s and continued in use well beyond that time, as the cross-continental trail turned into a major road for later pioneers coming into the area. The spring was sourced from a relatively small aquifer situated on the northern end of the Edwards Plateau and the southern end of the High Plains, being, structurally, a collecting sink of lower Cretaceous (Fredericksburg) limestones and sands. The spring aquifer held a large quantity of water due to the great number of fractures, solution channels, and interstices in the rocks and underlying sands, although the areal extent of the Big Spring sink is estimated to be only 1 mi (2 km) in diameter, with the main area only 3,000 ft (914 m) wide and almost circular, with some ellipticity trending towards the west. The Cretaceous beds subsided about 280 ft (85 m) below their normal position, centered on the southeast quarter of Section 12, Block 33 T1S; T&P RR Co survey, and the entire stratum appears to be preserved within the sink, the surface topography roughly following the subsurface subsidence. This writing identifies the sink as one of a number of similar subsurface geologic features in the surrounding area, differing from the Big Spring sink only in the fact that the surface topography above the others, while showing some decline, does not dip low enough to intersect the top of the water tables; hence, no springs could form from the other aquifers. In a passing comment, enigmatic in its content and disappointing in its brevity, the report states no other comparable deep sinks formed elsewhere on the Edwards Plateau. The same publication suggests the spring's discharge volume was in excess of 100,000 U.S. gallons (378,541 L) per day at the time of the railroad's arrival in the area in the late 1880s. The water was heavily mined by wells built by both the railroad and the early town of Big Spring, greatly in excess of its modest recharge rate, until the water table first dropped below the level of the spring outlet, and, finally, was completely depleted by the mid-1920s. The city now artificially fills the spring from its current source of water as a means of allowing residents and visitors to maintain some idea of how it appeared in times past. Big Spring is located slightly south of the center of Howard County in the valley of Beals Creek, an east-flowing tributary of the Colorado River. Interstate 20 runs through the northern side of the city, with access from exits 174 through 182. I-20 leads east 108 miles (174 km) to Abilene and west 40 miles (64 km) to Midland. U.S. Route 87 (Gregg Street) runs through the center of Big Spring, leading north 106 miles (171 km) to Lubbock and southeast 86 miles (138 km) to San Angelo. According to the United States Census Bureau, Big Spring has a total area of 19.2 square miles (49.7 km2). About 19.1 square miles (49.5 km2) are land, and 0.1 square miles (0.2 km2), or 0.45%, is covered with water. As of the census of 2000, 25,233 people, 8,155 households, and 5,463 families resided in the city. The population density was 1,320.4 people per square mile (509.8/km²). The 9,865 housing units averaged 516.2 per square mile (199.3/km²). The racial makeup of the city was 76.69% White, 5.31% African American, 0.59% Native American, 0.63% Asian, 0.02% Pacific Islander, 14.41% from other races, and 2.35% from two or more races. Hispanics or Latinos of any race were 44.64% of the population. Of the 8,155 households, 32.8% had children under the age of 18 living with them, 48.3% were married couples living together, 14.1% had a female householder with no husband present, and 33.0% were not families. About 29.2% of all households were made up of individuals, and 14.6% had someone living alone who was 65 years of age or older. The average household size was 2.51, and the average family size was 3.10. In the city, the population was distributed as 23.6% under the age of 18, 9.9% from 18 to 24, 32.7% from 25 to 44, 19.7% from 45 to 64, and 14.1% who were 65 years of age or older. The median age was 35 years. For every 100 females, there were 125.2 males. For every 100 females age 18 and over, there were 132.3 males. The median income for a household in the city was $28,257, and for a family was $35,448. Males had a median income of $27,636 versus $21,863 for females. The per capita income for the city was $14,119. About 17.1% of families and 22.2% of the population were below the poverty line, including 30.0% of those under age 18 and 18.3% of those age 65 or over. Big Spring is the site of several major hang-gliding championship tournaments, including the U.S. Hang Gliding Nationals. The city was also the site for the filming of parts of Midnight Cowboy and Hangar 18. The Big Spring Heritage Museum contains pioneer and indigenous artifacts, art exhibits, and the largest collection known of Texas Longhorn steer horns. Its rare and unusual phonographs include models by Thomas A. Edison. It also houses a large collection of dolls. The museum is located at 510 Scurry; an admission fee is charged. The picnic pavilion at Big Spring State Park was built by the Civilian Conservation Corps in the 1930s. Following the 2011 redistricting, Howard County is represented in the Texas House of Representatives by the District 72 Republican Drew Darby of San Angelo. Scenic Mountain Medical Center serves the community. The Texas Department of Criminal Justice operates the Big Spring District Parole Office in the city. The Texas Department of State Health Services operates a 200-bed psychiatric hospital, opened in 1939. The hospital has reduced its number of beds over the years, but remains one of the largest employers in Big Spring. The United States Postal Service operates the Big Spring Post Office. The Federal Bureau of Prisons (BOP) operates the Federal Correctional Institution, Big Spring in Big Spring. The nearby Big Spring Correctional Center is privately operated (GEO Group) on behalf of the BOP. The Colorado River Municipal Water District operates a reclaimed water treatment plant in Big Spring, the first of its kind in Texas, the product of which is then delivered to the potable water treatment plants of Big Spring, Stanton, Midland, and Odessa. Larry Arnhart, a writer and scholar, graduated from Big Spring High School in 1967. Betty Buckley is a Tony Award-winning theater, film, and television actress and singer. Carl Bunch was the drummer for Buddy Holly during the "Winter Dance Party" tour in 1959 in which Holly died (the Day the Music Died), and later for Hank Williams, Jr. and Roy Orbison. Putt Choate was a National Football League (NFL) player for the Green Bay Packers. Mike Christie was an NHL player for the California Seals and Cleveland Barons. Bubba Franks, former NFL tight end for the Green Bay Packers, was born in California, but was raised and played high school football in Big Spring. Jesse Whittenton, NFL player for the Los Angeles Rams and Green Bay Packers, was a member of the 1961 and 1962 NFL-champion Packers. ^ a b c "Geographic Identifiers: 2010 Census Summary File 1 (G001): Big Spring city, Texas". American Factfinder. U.S. Census Bureau. Retrieved March 16, 2018. ^ Pickle, Joe (1980). Gettin' Started, Howard County's first 25 years. Big Springs [sic], Tex. : Heritage Museum. ISBN 0-89015-268-3. ^ Hill, R.T. 1890. "A brief description of the Cretaceous rocks of Texas and their economic value". In: Dumble, E.T. (ed. ), First Annual Report of the Geological Survey of Texas, 1889. Austin: State Printing Office, pp. 105–141. ^ "Cult Movie Blogging: Hangar 18 (1980)". John Kenneth Muir. Retrieved June 14, 2013. ^ "The Secrets of HANGAR 18 (1980)". Space: 1970. Retrieved June 14, 2013. ^ Livingston, P.P. ; Bennett, R.R. (1944). Geology and ground-water resources of the Big Spring area, Texas. Water Supply Paper 913. United States Geological Survey, 113 pp. ^ "Population and Housing Unit Estimates". Retrieved November 11, 2018. ^ Inc., Advanced Solutions International,. "iMIS". www.ushpa.aero. Retrieved 4 April 2018. ^ "Hangar 18". 13 March 1981. Retrieved 4 April 2018 – via www.imdb.com. ^ "Parole Division Region V Archived September 26, 2011, at the Wayback Machine." Texas Department of Criminal Justice. Retrieved on May 22, 2010. ^ "Post Office Location – BIG SPRING Archived 2012-06-12 at the Wayback Machine." United States Postal Service; retrieved May 22, 2010. ^ "FCI Big Spring, Contact Information." Federal Bureau of Prisons. Retrieved on May 22, 2010. ^ "CI Big Spring Contact Information." Federal Bureau of Prisons. Retrieved on May 22, 2010. ^ " "Archived copy". Archived from the original on 2016-08-15. Retrieved 2016-08-29. CS1 maint: Archived copy as title (link)", GEO Group. Retrieved on July 25, 2013. ^ "Water Treatment Plant". Big Spring, Texas. City of Big Spring. Retrieved 2015-03-08. ^ "Foundation Partners with Carollo Engineers on Innovative Research". WateReuse. Archived from the original on 2015-04-02. Retrieved 2015-03-08. ^ "Testing Water Quality in a Municipal Wastewater Effluent Treated to Drinking Water Standards". Texas Water Development Board. Archived from the original on 2015-04-02. Retrieved 2015-03-08. ^ "Texas - Israel Cooperation". www.jewishvirtuallibrary.org. Retrieved 4 April 2018. 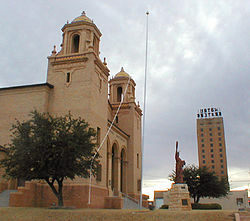 ^ "Big Spring, San Miguel El Alto announces sister city status". mywesttexas.com. Retrieved 4 April 2018. 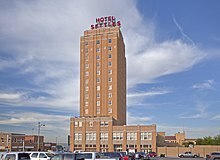 Wikimedia Commons has media related to Big Spring, Texas.